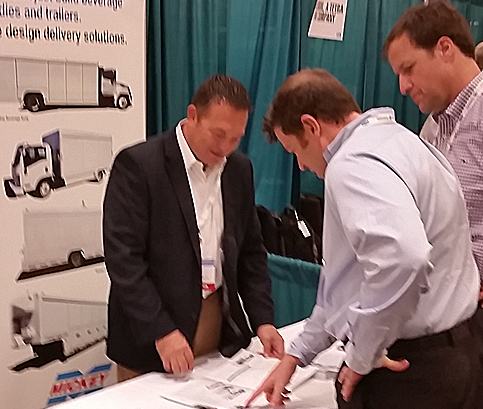 Dane Meyer (left), Mickey’s Western Regional Manager, discusses Mickey’s wide line of beverage and vending bodies and unique features with attendees at the IBWA/NAMA show. Mickey’s ProVendTM Series of vending units, as well as the company’s popular side load water bodies, were the center of attention at the joint IBWA (bottled water)/NAMA (vending) trade show earlier this month in Dallas, TX. Mickey’s ProVendTM Series includes bodies built for virtually every type of vending route, including full-service, MicroMarkets, beverage, office coffee service, dry goods, fresh, frozen and refrigerated. Mickey is the largest vending body manufacturer in the U.S., and the industry’s only one-stop supplier of delivery vehicles for any type of vending operation. The various ProVendTM models are designed to make vending deliveries safer, easier and more profitable through the use of customer-driven features and options, such as roll-up side doors, rear swing doors, a variety of refrigeration systems, custom bay configurations, adjustable shelves, rear drop steps, double-door money safes, and hand truck storage racks, to name a few. At the same time, Mickey’s versatile side load water bodies captured the attention of the bottled water crowd attending the combined conference. The custom-built bodies are being widely used to deliver bottled water commercially and residentially as well as on “up-and-down-the-street” routes, and can easily accommodate front door or curbside deliveries. The bottled water bodies can handle everything from 8-ounce bottles to 5-gallon containers. This was the third consecutive year the International Bottled Water Association (IBWA) and the National Automatic Merchandising Association (NAMA) held their conferences during the same dates and in the same venue, allowing attendees to experience a higher level of networking and education through access to a wider variety of exhibitors and seminars.